Organizers are breaking with tradition. camera (Tobias Hase/picture-alliance/dpa/AP Photo) The "Ammer" beer tent is serving a chicken fricassee, but replacing the meat with soy cutlets. For some 200 years, Oktoberfest has been all about copious amounts of beer and meat. But, this year, organizers are breaking with tradition and reaching out to visitors with dietary restrictions by offering vegan dishes and even vegan wine. With its dozens of oxen spit roasts, enough rotisserie chickens to feed an army and pork sausages as long as a forearm, Bavaria's Oktoberfest is a meat lover's nirvana. In fact, last year's festivities saw a total of half a million chickens, 116 whole oxen and 115,000 pork sausages being served up in Munich's beer tents over a period of three weeks. But even in one of Germany's most rigidly traditional regions, times are changing. In an attempt to cater to the changing food preferences of visitors, beer tent owners have put vegan dishes -- and in one case, vegan wines -- on their menus. "As the event becomes more international, people with special dietary requirements and different culinary tastes are becoming the norm," says Wolfgang Nickl of Munich's city council, which is responsible for organizing Oktoberfest. It's not only foreign visitors who struggle with the meat-heavy menu, though. Vegetarianism and veganism are on the rise in Germany. About 800,000 of the country's 7 million vegetarians forego all animal products, according to the Association of German Vegetarians (VEBU). "Whether it's environmentalism, climate protection or health concerns, there is a growing awareness among Germans when it comes to the vegetarian agenda," says VEBU spokeswoman Stephanie Stragies. The Bachmaier family, who were inspired by their son's experience as an apprentice in a Munich-based vegan restaurant, were the first to take the leap. 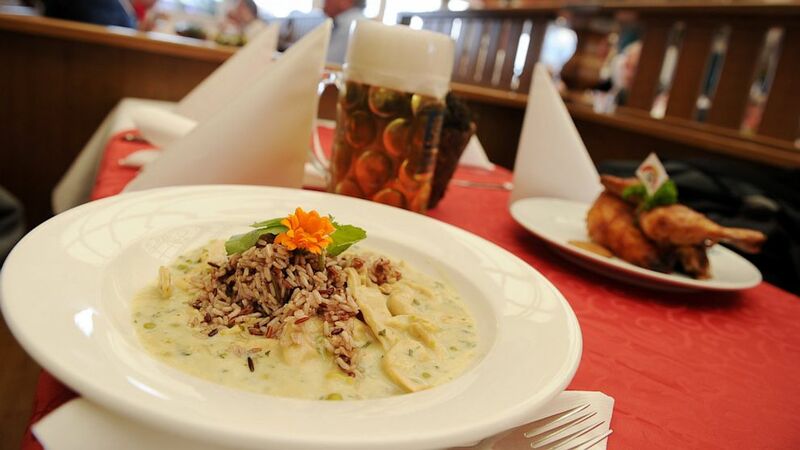 Among the dishes the family has added to its "Herzkasperl" beer tent's repertoire are soy "pork" medallions with sauteed chanterelle mushrooms and the traditional cheesy egg noodle bake known as "Käsespätzle" -- except without the egg or the cheese. "Vegan food is the best way to ensure that people of all religions, as well as those that don't eat animal products out of conviction, aren't excluded from the festivities," says Martin Jonas, who has been working at "Herzkasperl" for four years. "Though it's hard for Bavarians to change their approach, it makes sense. It's the lowest common denominator." Other tent owners, including the Ammers -- who are famous for their roast chicken -- have jumped on the culinary bandwagon. The family, which also runs a successful restaurant outside of beer festival season, is serving up a chicken fricassee, but replacing the meat with soy cutlets. The neighboring Fisch-Bäda tent, known for its vast selection of fish and seafood, has even added vegan red wine -- filtered without the use of animal proteins -- to its menu. Despite the increasing culinary diversity at Oktoberfest, those serving the food have noticed that the vast majority of visitors tend to stick to the traditional offering. "From what I've seen, the demand for it hasn't matched the popularity of the meat dishes," says Jonas. "After all, meat and beer is what this event is about, and that's not about to change." Indeed, the broad range of Bavarian beers available at Oktoberfest is the main attraction for locals and tourists alike. And regulations controlling the brewing of beer in Germany -- which date back to the beer purity law, or Reinheitsgebot, of 1516 -- mean that vegans can enjoy it, too. According to the German Brewers Federation, German beer may only be made from malt, hops, yeast and water. "The law ensures that most people with dietary requirements can still enjoy the beer," says Nickel. "Obviously, the gluten in beer is still a problem for some, but Bavarian brewers are traditionalists, so don't expect movement on that any time soon." Indeed, the Bavarian Brewers Association declined to comment on whether gluten-free beer was something the region's breweries would consider. But events coordinator Jonas is hopeful that change is on the horizon. "There's always a possibility," says Jonas. "Forty years ago, traditional Bavarians would have trembled at the prospect of open homosexuality at Oktoberfest, and now we celebrate 'Gay Sunday' here every year. Gluten-free beer could be next."